While we appreciate the Governor’s fulfillment of a three-year deal he made with state lawmakers to increase investments in California’s early childhood education system, now is the time to build upon the improvements we’ve made to restore and expand preschool by increasing access to meet California’s growing demand for infant and toddler care. The recession devastated California’s early care and education programs, especially those serving infants and toddlers. Many of them remain underfunded, forcing thousands of providers to close their doors and leaving thousands of California families without childcare. Only 14% of eligible infants and toddlers are enrolled in subsidized programs. 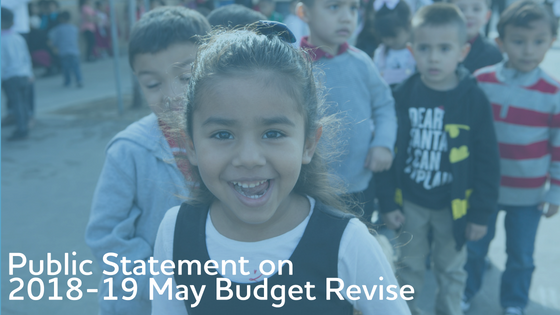 Today, our state is enjoying a large budget surplus, so it’s a matter of prioritizing California’s children and their families. Quality interactions between young children and their caregivers are crucial for their academic and social-emotional development, particularly during the most vulnerable window from birth to age 5. Early Edge California joins the Women’s Caucus and the child care and early education community in asking the Legislature to support high-quality programs for families with infants and toddlers. Early Edge also encourages investments in programs that meet the needs of young children who are dual language learners–who make up 60% of children under 5 in California–and increasing investments in the early childhood education workforce. Our youngest and most vulnerable children shouldn’t have to wait any longer to reap the benefits of living in the world’s 5th largest economy. Ongoing investments in our state’s youngest residents will not only benefit them individually, but will secure a stronger economic future for California. It just makes sense.